This is my first full season outside of Europe on Football Manager. Usually I start, struggle with the ‘foreignness’ of it all and return to Europe. Not this time! 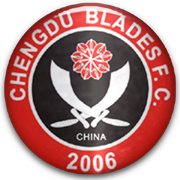 Chengdu Blades F.C.is a professional football club based in Chengdu, PR China who currently plays in the CFA Jia League (China League One.) The club was founded on February 26, 1996 and was formerly known as Chengdu Wuniu – named after their first sponsor, the Wuniu Cigarette Company. On December 11, 2005, English professional football club Sheffield United F.C. took over the club and changed the club badge as well as the team home kit to represent this. On December 9, 2010 Sheffield United sold their majority to Shenzhen based company Si Jiabo Group. The idea is to utilise the youth academy as much as possible, but this will not be a strictly ‘youth product only’ save. Loans and the occasional purchase/free transfer will be permitted, much like how real clubs implement the policy, such as Ajax. I will also endeavour to adhere to a nationalistic policy, to aid the China National Team as much as possible and hopefully improve upon their 80th placed world ranking – I hope to one day get the job myself! I was tasked with getting promotion as a minimum, while also playing attacking football. Promotion took a while to achieve, with us winning the league with a game to spare, though despite setting our tactic up as quite attacking, the lack of personnel in the attacking positions meant our formation wasn’t conductive to attacking play, with us forced to utilise a 4-5-1 ‘pentagon’ with two DM’s, MR, ML and an AMC behind the lone striker. Needless to say, we failed the attacking football element, but the league win more than ensured I stayed in the job! We started our FA Cup campaign well with a thrashing of Chonquing but Henan, from the top division, were too much for us, especially away from home. I wasn’t too disappointed to go out at this early stage as the league was a much bigger priority. 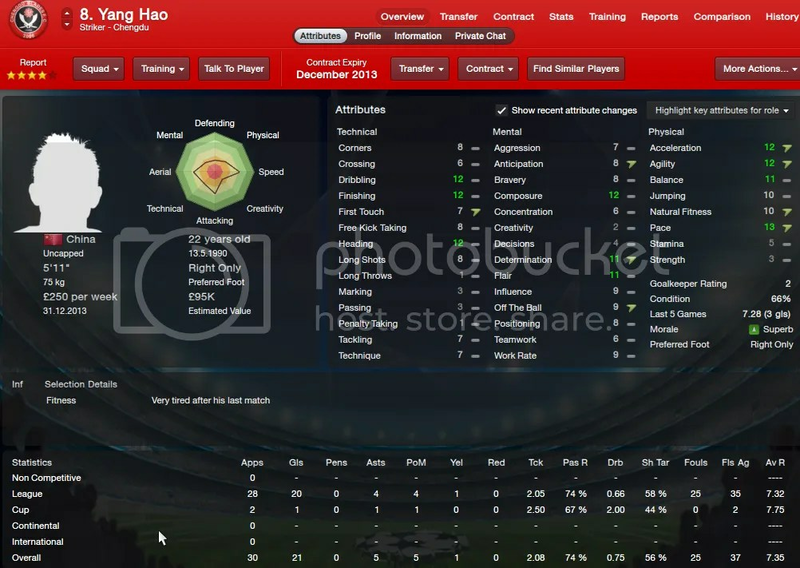 Yan Hao was our star player, scoring 21 goals in 30 games. It was far from the yield I expect from a striker, but we had to make do with the players we had, and he did well in the circumstances. We were over wage budget but had a small and weak squad. We couldn’t afford to let anyone go or bring in anyone that we’d have to pay, so I went scouring the loan list. We could have done with another two or three more, but the only other players of suitable quality rejected us, unfortunately.